It started because this school year I have been doing loads of reading about best practice teaching strategies and practices of master teachers. 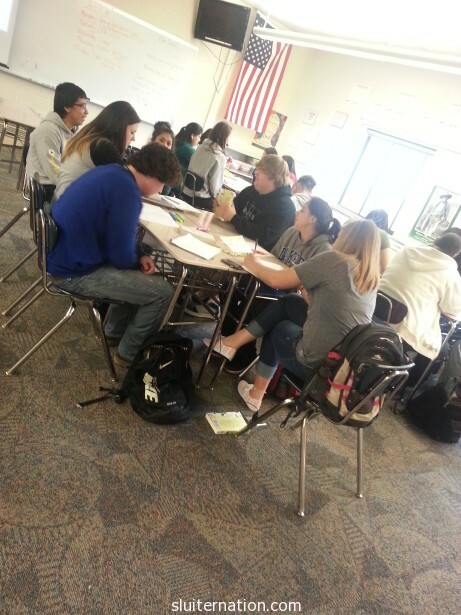 Specifically, I was inspired after reading Collaboration & Comprehension: Inquiry Circles in Action and after attending a training about reading workshops by Penny Kittle based on her book Book Love. I had already jumped on the opportunity to get some new books via the English department for my students to do student book clubs with (I wrote about the six books our department got here). I had ideas…but no real plan. After a day listening to Penny Kittle talk about reading workshops, my brain was on fire scaffolding what I had learned from reading the Daniels/Harvey book. It’s going well. 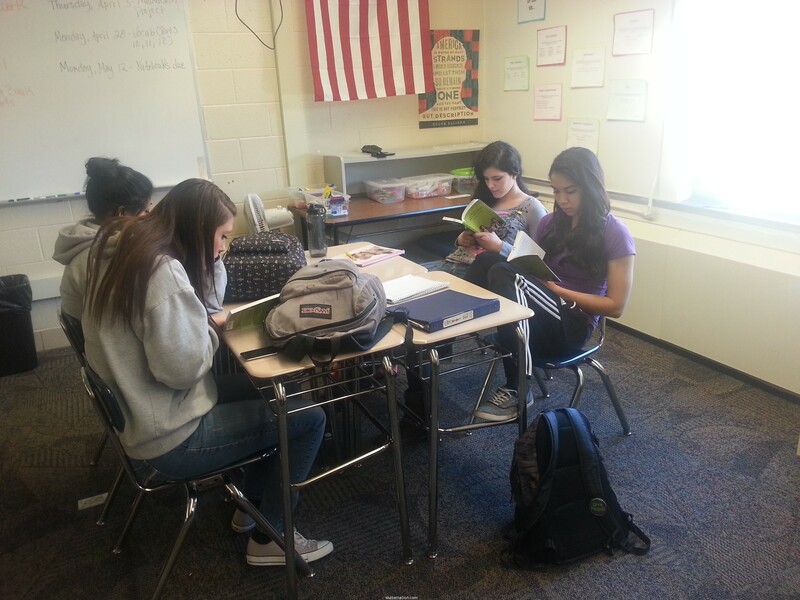 Even with it being the end of their senior year of high school, my students are reading. With the exception of only a few students, even my self-proclaimed non-readers have told me they love their books. But I want MORE for next year. I don’t want to go back to one “large work” per quarter next year. I don’t want to teach a novel (or play or poem or whatever) separate from writing, grammar, and vocabulary. I want it all to go together. And I want my students to be reading a lot. This year was a test…if I give the kids choice and ownership, will they actually read? Will they do the work? The answer so far is a giant YES. I am not going to abandon my belief in teaching students the classics. In fact, I am hoping that by switching to my plan, students will read more classics…because they want to. Next year I want to run student book clubs once a quarter. I also want to run reading workshops all year long. What does that mean, exactly? Students would practice goal-setting and tracking. At the start of each quarter, students would set a goal for how many books they will read. They will keep track of pages/books read. 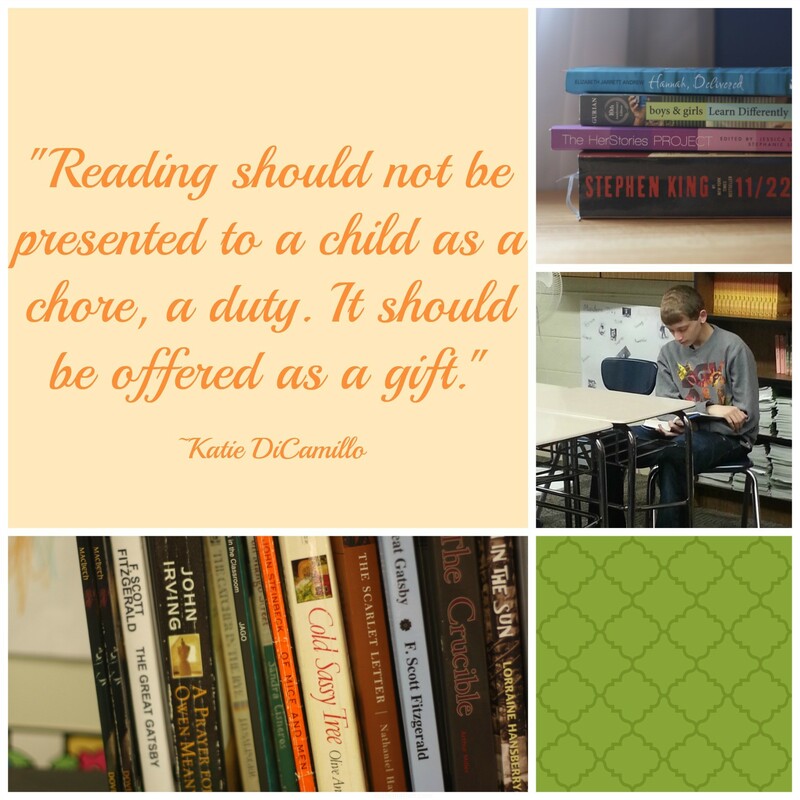 Students will read every day. Students will write about their reading. Students will talk about what they are reading with me and with other students. Students will unpack the writing styles and rhetoric of what they are reading to study the writer’s craft (mastering writing, grammar, usage, vocabulary, and style). 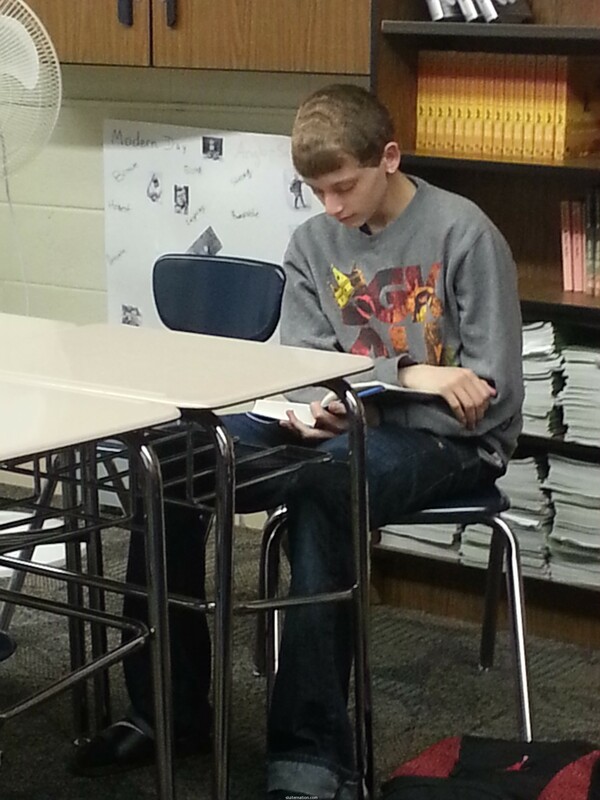 As students read, they will build stamina and endurance for reading longer, more challenging texts. Students who are college-bound will be encouraged to choose classics a few times a year. This is my current classroom library. 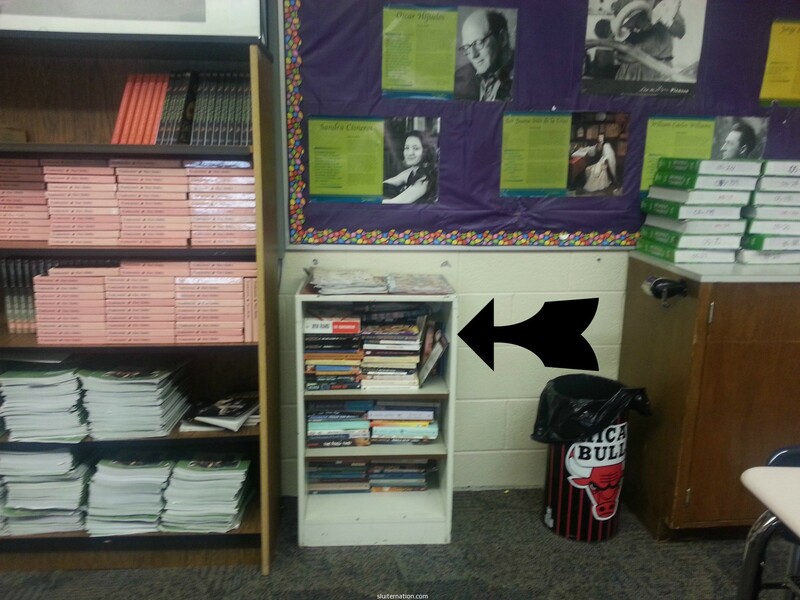 That tiny bookshelf hold all 104 books in my classroom library. Yes, I have access to novels that have been taught in the past (see all those copies of Frankenstein? Yeah, there are not that many kids who would choose that book. ), but not enough to rotate through the 120+ students I have. Yes, we have a media center. But sending kids to the media center for books takes them out of the classroom. I want them to be able to grab a book whenever they are in my class. I want zero excuses for not having a book to read. I want a LIBRARY in my room. I want kids to run their hands over the book spines the way I do at home when I am trying to choose a new book, the way I do when I am remembering all the stories I have already read. I want kids to hold books regularly. Sending kids to the media center during class time wastes time. Sending them on their own time means it won’t happen. I want them to be able to spot a book from across the room–the way you spot an interesting person–and want to walk over and get to know it better. I never want any student of mine to suffer word poverty. They suffer enough poverties as it is. What I have so far in my library I have purchased myself, and it’s not much. I can find the funds to add a few books each year, but I have nowhere near what I need to punch it up into something usable for the fall. If I have learned anything at all, it’s that I cannot do this teaching thing alone. I’ve created a class library wish list on Amazon. I am not an affiliate, so no purchases give me anything other than books for my students. Along with donations, I am also busy working on applying for a grant to help purchase books for my classroom library too. I want to thank all of you for your support, be it books or donations or just virtual high-fives. Your encouragement is a BIG part of why I get on fire to be the best teacher I can be each day. And read to your kids. I love you and your vision! I am packing all the books I have read into a box and sending them to you and your students, where I know they will be read over and over. That brings me joy. you are amazing. thank you thank you thank you! What an amazing idea and a great gift to your students. Would you be interested in used books (in decent condition, of course)? Would you accept books that aren’t from your wish list? I’d love to know how I can help, not only personally, but by reaching out to the community of writers I’m in touch with regularly to see if we can’t help you build your library. Love what you are doing! YES! any and all book donations would be WONDERFUL!!! I just made the wish list as a place to start, but used books and things not on the list are completely welcome! Yay! I’ve put up a blog post, and will be spreading it among my various groups this week. Excited to see the results of what you are doing! Amber West recently posted…Building a Dream Out of Books! BOOKS are coming my sweet! I can see your dream and can’t wait to watch it come true for YOU and your very lucky students. this overwhelms me with emotion. So much love for my students…who people have never met. It’s just…it’s just wonderful. We have a few of those books that have been read and I’m pretty sure they won’t be read again. I’d love to pass them on to you! I’ll go through our shelves with my kids and email you our list. I ordered some, then went back and saw MORE that I have read and loved. I’ll see if I can find them. This is such an awesome project. You are the awesome one. Thank you so much! I love this idea so much! I’m such a book hoarder but I will go through our collection and find some great ones for you. It would make my husband happy to if I cleaned out our shelves! 🙂 Best of luck. thank you so much! I end up bringing in LOTS of my old books too. That is mostly where my class library comes from, books I’ve bought, read, and want to put in someone else’s hands. I’m pretty sure I still have a box or two in my attic of books. I usually donate them to a local library but I’d love to contribute to this. Have you reached out to Amazon, B&N, and maybe some local bookstores? They may be able to make small donations as well. And please edit my “your” to “you’re”. LOL! You are amazing. I have been watching your book club situation unfolding and I keep wishing that I had had a teacher like you. This is a cause I can really get behind. Get it girl!! Oh girl, this is the nicest compliment! I can’t wait to blog the progress of the book clubs and the progress of the libraries and next year’s reading workshops. I am fired up! I love that you are doing this so much. You rock, my friend. I *liked* reading when I was in school, but I didn’t LOVE reading until I had the power to choose the books that interested me and that friends recommended. It is such a different experience from someone assigning a book to you. that was me too, Kim. I was always in love with reading, but it’s because my mom took me to the library since I was very small and I chose what I wanted to read. I hardly remember the books I read in high school (other than senior year and that was because of the awesome teacher), but the books that I chose stick with me. i want that for my students. Here’s hoping for that library before too long. Middle & early high school nearly killed me as a reader — it wasn’t that I wasn’t smart or anything, I just hated being told what to read & when to read it. Seriously, as a 6th grader, I had to spend an hour every day, or my summer vacation, reading Little Women, until it was done. A boy going through puberty having to not play outside & not swim & not doing whatever boys would want to be doing to read about a bunch of stupid girls & their tribbles (I realize, now, that the book is far more nuanced — but to a kid going into 6th grade, it was torture). This plan of yours? It would have fixed my reading problem far before (what actually got me reading was my senior year of high school, when we would discuss the books we had to read (I still wasn’t reading), but 1984 captured me, and I found myself actually reading it, on my own, in college, to see if it still captured me the same way . . . and actually reading it, rather than just discussing it, did me even better). Far too many students are going to resist when you say “you have to do this,” but a guided “you should do this” can really make for incredible learning opportunities. YES! I read the books I was assigned because that is how I am. But I didn’t love it. Until 12th grade when, like you, we were discussing things (I had a phenomenal teacher). Now I am reading all those books as an adult and I love them. But had I not been reading books that I chose I would have given up on reading. And you make a point that I always think about too: boys tend to “drop out” of reading more so than girls do. Both of my brothers would tell you they aren’t readers, although they totally are. They just read nonfiction. That they choose. In high school? No, they did not read. My dream is that my library gets big enough that I can organize it by genre so kids can easily find something they are interested in. Oh I get swoony thinking about it! Love love love your vision (came here by way of Alison and saw her stack she is preparing for you on Instagram). I’ll take a look at your list and either send you some or do the Amazon thing soon! Thank you!!! I spent my lunch telling my colleagues about it and I burst into tears when I started telling them how generous people are…and that I am getting books from Alison all the way on the other side of the globe. The internet is amazing. What a change you’re going to have by next year, Kate. Though, have you checked out any local Goodwill shops for books? A lot of times you can get good deals on fun books there too. Since I donate used books to two local teachers right now, I’m passing this post on to others instead. But if you’re looking for more by the end of the summer… Put out the call again, and you know you’ll get a lot of book love. 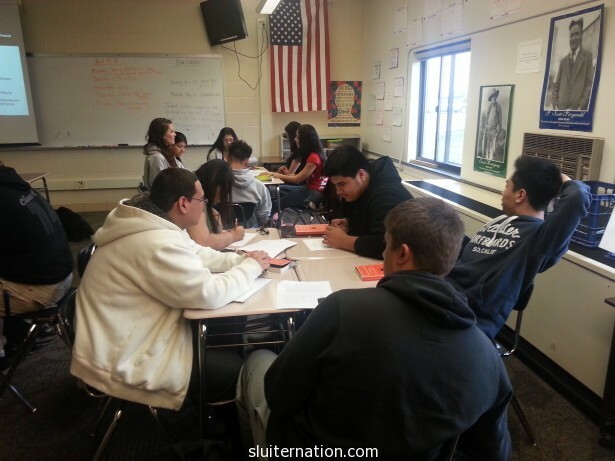 I just found this blog and I’m proud to say I had Mrs. Sluiter as a junior in high school! She’s one of the nicest teachers I’ve ever had. I wasn’t the best student in school, but she helped me open my mind to my creative potential, and I haven’t looked back since. I have a few books I’d like to donate, this is such an awesome cause! I love your idea’s because they remind me of a class I took my Sr. year of high school. The class was called reading for pleasure and my teacher was a Mrs. Swisher. Her classroom was wall to wall bookshelves, beanbags and dollar store throws. The point of the class was to read. We had to have a book, not sleep, and write a sort report (5-10 sentences) each day on what we read. We did have to write a 4-6 pg report but that was the only assignment. I wish everyone could have had Mrs. Swisher and taken that class. I was already a reader but to have a class that promoted reading engrained the importance of it in my soul. Good luck on your journey! I love the idea of being able to walk into a classroom and pick up a book. And I agree with your comment about not necessarily appreciating assigned books until I was older. I’ve always loved the idea of delving into a new world, someone else’s life and experience. Will do you do the honor system for borrowers or set up a mini catalog kind of thing with who borrowed/brought back, etc.? This is simply the coolest thing ever. Andrea recently posted…What Happened Here? page conations genuinely nice funny information too.